It is important to note that the information shared in Guise (2010), the 400 page Evidence Report on which the 2010 NIH VBAC Conference was based, collected the best data we have available on trial of labor after cesarean. That said, they reported, “Overall, the strength of evidence on perinatal mortality was low to moderate” due to the wide range of perinatal mortality rates reported by the studies included in the report. Bottom line: We still don’t have an accurate idea of how deadly uterine rupture is to babies. 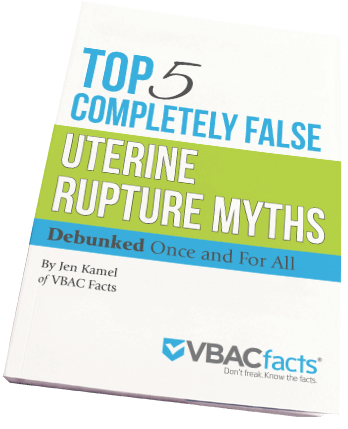 How many times have you heard, “Only 6% of uterine ruptures are catastrophic” or “Uterine rupture not only happens less than one percent of the time, but the vast majority of ruptures are non-catastrophic?” But what does that mean? Does that mean only 6% of uterine ruptures are “complete” ruptures? Result in maternal mortality? Perinatal mortailty? Serious injury to mom or baby? This article will explain to you the difference between uterine rupture and uterine dehiscence as well as explain the source and meaning of the 6% statistic. Uterine rupture is defined as a full-thickness separation of the uterine wall and the overlying serosa. Uterine rupture is associated with (1) clinically significant uterine bleeding; (2) fetal distress; (3) expulsion or protrusion of the fetus, placenta, or both into the abdominal cavity; and (4) the need for prompt cesarean delivery and uterine repair or hysterectomy. Uterine scar dehiscence is a more common event that seldom results in major maternal or fetal complications. By definition, uterine scar dehiscence constitutes separation of a preexisting scar that does not disrupt the overlying visceral peritoneum (uterine serosa) and that does not significantly bleed from its edges. In addition, the fetus, placenta, and umbilical cord must be contained within the uterine cavity, without a need for cesarean delivery due to fetal distress. When reading medical studies, look for how they define uterine rupture in the “Methods” section. While some medical studies combine the statistics for rupture and dehiscence, ultimately reporting an inflated rate of rupture, other studies distinguish between the two events. So, what does the 6% statistic mean and where did it come from? The overall risk of perinatal death due to uterine rupture was 6.2 percent. The two studies of women delivering at term that reported perinatal death rates report that 0 to 2.8 percent of all uterine ruptures resulted in a perinatal death (Guise 2010). In other words, of the women who had uterine ruptures, 6.2% (1 in 16) resulted in infant deaths. When we limited the data to women delivering at term, as opposed to babies of all gestational ages, the risk was as high as 2.8 (1 in 36)%. When we look at the overall risk of perinatal mortality during a trial of labor after cesarean, the NIH reported the rate of 0.13%, which works out to be one infant death per 769 trials of labor. The problem with this statistic is that some people have misinterpreted it to mean that only 6% of ruptures are true, complete uterine ruptures. In other words, if we take the 0.4% (1 in 240) uterine rupture rate (Landon, 2004), they believe that only 6% of those ruptures or 0.024% (1 in 4166) are true, complete ruptures. This is false. The 0.4% uterine rupture statistic measured true, complete, uterine ruptures in spontaneous labors after one prior low, transverse (“bikini cut”) cesarean. So how many dehiscences did Landon (2004) detect? Landon reported a 0.7% uterine rupture rate and a 0.7% dehiscence rate. (Note that these statistics include a variety of scar types as well as spontaneous, augmented, and induced labors.) So Landon found that dehiscence occurs at the same rate as uterine rupture. I think the best way to avoid confusion is to use very clear language: 6.2% (1 in 16) of uterine ruptures result in an infant death. Put another way, for every 16 uterine ruptures, there will be one baby that dies. What determines if a baby dies or has brain damage? Some research on infant cord blood gases has suggested that if the baby isn’t delivered (almost always by CS) within 16 – 17 minutes of a uterine rupture, there can be serious brain damage or death to baby. Now you know the difference between uterine rupture, uterine dehiscence and the meaning of the 6% statistic. It’s helpful to understand the terminology used in relation to uterine rupture otherwise it can be very confusing as you wade your way through the statistics. It’s also very important for people to use specific words whose definitions are clear instead of words such as “catastrophic” that could mean multiple things. The following are excerpts from the Evidence Report (Guise 2010) , the 400 page evidence report assembled for the 2010 NIH VBAC Conference. The limitation of Guise (2010) is that these stats are for all VBACs – all scar types, multiple prior cesareans, induced/augmented labors, etc. It would have been helpful if they had broke out the data in these ways. While rare for both TOL [trial of labor] and ERCD [elective repeat cesarean delivery], maternal mortality was significantly increased for ERCD at 13.4 per 100,000 versus 3.8 per 100,000 for TOL. The rates of maternal hysterectomy, hemorrhage, and transfusions did not differ significantly between TOL and ERCD. The rate of uterine rupture for all women with prior cesarean is 3 per 1,000 and the risk was significantly increased with TOL (4.7 1,000 versus 0.3 1,000 ERCD). Six percent of uterine ruptures were associated with perinatal death.” Perinatal death due to UR from term studies was 2.8%. “Perinatal mortality was significantly increased for TOL at 1.3 per 1,000 versus 0.5 per 1,000 for ERCD… VBAC is a reasonable and safe choice for the majority of women with prior cesarean. Moreover, there is emerging evidence of serious harms relating to multiple cesareans… The occurrence of maternal and infant mortality for women with prior cesarean is not significantly elevated when compared with national rates overall of mortality in childbirth. The majority of women who have TOL will have a VBAC, and they and their infants will be healthy. However, there is a minority of women who will suffer serious adverse consequences of both TOL and ERCD. While TOL rates have decreased over the last decade, VBAC rates and adverse outcomes have not changed suggesting that the reduction is not reflecting improved patient selection. A systematic review strives to be patient-centered and to provide both patients and clinicians with meaningful numbers or estimates so they can make informed decisions. Often, however, the data do not allow a direct estimate to calculate the numbers that people desire such as the number of cesareans needed to avoid one uterine rupture related death. The assumptions that are required to make such estimates from the available data introduce additional uncertainty that cannot be quantified. If we make a simplistic assumption that 6 percent of all uterine ruptures result in perinatal death (as found from the summary estimate), the range of estimated numbers of cesareans needed to be performed to prevent one uterine rupture related perinatal death would be 2,400 from the largest study,204 and 3,900-6,100 from the other three studies of uterine rupture for TOL and ERCD.10, 97, 205 Taken in aggregate, the evidence suggests that the approximate risks and benefits that would be expected for a hypothetical group of 100,000 women at term gestational age (GA) who plan VBAC rather than ERCD include: 10 fewer maternal deaths, 650 additional uterine ruptures, and 50 additional neonatal deaths. Additionally, it is important to consider the morbidity in future pregnancies that would be averted from multiple cesareans particularly in association with placental abnormalities. Totally agree that the confusion here comes down to the use of the word ‘catastrophic’. If, by ‘catastrophic’, folks mean ‘someone dies’, this is where the waters get muddied (in the case of the Landon, 2004 stats, anyway). It is so important to mind one’s language with regards to stat discussion. In South Australia, our government perinatal guidelines reference a VBAC rupture rate between 0.5% and 1% (stating that “most series” report this). I wondered if you could point me in the direction of the series which report a rupture closer to 1%? I am keen to know if these reports include dishiscences as well as complete ruptures. Landon (2004) reported a uterine rupture rate of 1.0% among induced labors. Mercer (2008) reported a rate of 0.87% among spontaneous labors and 1.37% among induced labors. These statistics are only relevant to hospital birth. The neonatal mortality rate following uterine rupture is low +/- 6% IF DELIVERY IS WITHIN 16-28 MINUTES from the time of rupture. Which is nearly impossible if transporting from home, even if you live near the hospital. After this timefram has passed, neonatal mortality rates rise to 60%. Do the research. This kind of article is dangerous and irresponsible. Absolutely. I reference the 17 minute time frame in the article above which is one of the risks of homebirth. I had to have a c section with my first child. There were complications, as my cervix swelled, I stopped dialating, and she went into distress. Afterwards, they realized she was stuck. The c section was needed but now I am pregnant with my second and want to do a VBAC. I met with my new doctor today, as we recently moved. I felt she was trying to sway me to have another c section. She told me I was at risk for things to go wrong during VBAC because of the complications with my first birth. I am concerned about the risks during a VBAC. I feel confused and uncertain. Any comments are appreciated. I’ve posted your question here. I shared your comment over on Facebook. Join us there to view the responses. Hmmm,always something to think about. How about we prevent unnecessary c-sections in the first place. We could help families to make decisions based on fact instead of fear. We sometimes feel like we can have all of the answers, but reality is that not all births are picture perfect,even in the best of circumstances. I completely agree. We need to prevent unnecessary primary (and repeat) cesareans. One of the things that can make that happen is for women to be aware of how the risks increase in post-cesarean pregnancies regardless of the mode of delivery, and especially if a mom has multiple repeat cesareans. Unfortunately, primary and repeat cesareans are generally viewed as benign by the public. I was with a woman who wanted to have a VBAC at home. She was 8cm when she insisted ‘something was wrong’. An ambulance was called, she was transported to hospital and everyone flew into action. Surgery determined her baby had delivered into her abdominal cavity but both mother and baby were fine. The surgery was performed about 1.25 hours after she initially felt something was wrong. The lesson for me . . . always listen to the mother! As much as I’m a proponent of home and natural birth, I think it’s pretty dangerous to do a first VBAC at home–should there be a uterine rupture, you could lose both mother and baby, and there really isn’t time to get to the hospital in that situation. You can still have all those things in hospital with a CNM or other provider willing to give the support necessary. Home VBAC carries that risk. So let’s work to make hospital VBAC a reality for more women by sharing quality information with moms and care providers (https://www.vbacfacts.com/2012/04/11/best-compilation-of-vbac-research-to-date), strategies so hospitals without 24/7 anesthesia can safely offer VBAC (https://www.vbacfacts.com/2010/07/22/vbac-ban-rationale-is-irrational/), and demonstrate how these policies makes birth safer for everyone (https://www.vbacfacts.com/2012/03/27/just-kicking-the-can-of-risk-down-the-road). Becky, I’m not sure you can so simply draw that conclusion. Lack of unnecessary interventions, freedom of movement, lack of restrictions of food and fluids, close attendance of the hb midwife, and overall greater level of comfort of the mother very likely would decrease the incidence of complications in the first place. Furthermore, close observation of the mw to spot issues early on and call ahead while in transport to hospital can decrease risks. Do you have any evidence for any of this? The one difference might be the lack of augmentation or induction at home, but homebirths may be more likely to be prolonged labors, which is also a risk factor for a uterine rupture. In any case, *if a rupture happens,* we already know that time is of the essence to prevent a death or brain damage. Being a half or more away from the OR instead of 10 minutes absolutely will affect the mortality rate. Katie thats not true a uterus rupture is not something that can be prevented with lack of intervention and food in take during child birth at home. I’ve had it happen and me and my son are happy and well thanks to the doctors and nurses that acted quickly. I’m sure if I was home my life would be very different. I think your statement is quite ignorant and you are unaware of what its like to endure that kind of trauma. And just so you know the time it takes for an ambulance to get you from your home to a hospital could be much to long. You or your baby could be one of those catastrophic ruptures. I’m greatful for my life and my sons life. Its all because of the doctors, nurses and surgeons in a facility capable to handle those kind of problems. Stephanie, you said “uterus rupture is not something that can be prevented with lack of intervention”. That is mostly false (I use “mostly” instead of “absolutely” only due to the fact that ruptures cannot be fully prevented in any pregnant woman’s circumstances). Interventions such as inductions, epidurals, anesthesia and coached pushing CAN have an impact on UTERINE rupture rates. The less the body is messed with while in labor (or to put it into labor), the more likely things will turn out well. I’m sorry that you had a rupture, but the fact of the matter is just because YOU felt better to have your vbac in a hospital (I am assuming it was a vbac, but uterine ruptures do occur in vaginal deliverers without have prior c/s, so I can’t be sure) doesn’t mean the risks are higher at home or that interventions don’t cause more ruptures (possibly causing more ruptures than the lives they save even, possibly). The differences in a woman’s comfort and lack of interventions experienced at home do have an impact. And who is to say that the increased stress in a hospital setting, that causes increased adrenaline, wouldn’t contribute to a rupture? The factual statistics aren’t there for all of this yet. But there has been some proof that interventions can contribute to bad outcomes in vbacs and in TOLAC. Nice article. It is important for parents to keep in mind that this mortality rate is based on babies born in hospital. The mortality rate for rupture at a homebirth would likely be much higher, since time is so much of the essence when a rupture occurs.